As 15-year-old Dorothy Counts-Scoggins walked toward the entrance of Harding High School on Sept. 4, 1957, she endured the taunts of both children and adults. They threw sticks and rocks, pushed and shoved her and even spat on her. 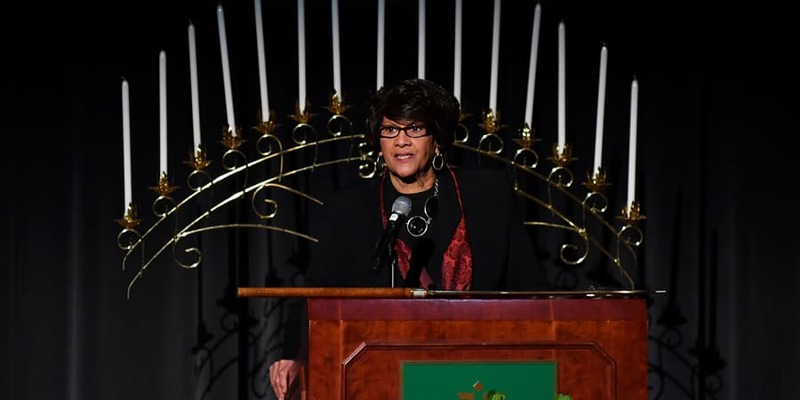 But Counts-Scoggins—one of four African American students to integrate Harding High—drew on the words of her father to prevent her from succumbing to the hateful acts, she told the audience inside the Cone University Center’s McKnight Hall during UNC Charlotte’s Martin Luther King Jr. Celebration on Tuesday, Jan. 22. “You can do anything you want to do, and no one can stand in your way,” Counts-Scoggins told the celebration attendees. So she kept walking, determined to pursue the education she not only desired but was entitled to as an American citizen. “Through all this, pride illuminated from my face as I carried myself with dignity when met with such hatred and humiliation,” Counts-Scoggins said. “I continued to walk with dignity, remembering that I was not alone. I carried the love and support of my family and the African American community. Speakers drew correlations between the civil rights struggles of yesterday and today. Chancellor Philip L. Dubois noted that in Charlotte, Counts-Scoggins gave life to the U.S. Supreme Court’s landmark 1954 Brown v. Board of Education decision desegregating schools. With the support of the African American community, Counts-Scoggins was among four students to integrate Harding High with the hopes of obtaining a better education. Dubois said Counts-Scoggins’ bravery paved the way for the first full-time African American students to attend Charlotte College—now UNC Charlotte—in 1961. She retired from Child Care Resources Inc., a nonprofit care resource and referral agency that helps provide early education opportunities for children in the community. “I know that I was the chosen one to be a servant to lead the way for others,” Counts-Scoggins said. Tuesday’s event also featured a spoken word performance by alumnus Boris “Bluz” Rogers and music from the Voices of Eden Gospel Choir. The University’s celebration of Martin Luther King Jr. continues on Jan. 25 with a Day of Service, which offers members of the campus community opportunities to volunteer with local nonprofit organizations. View more photos from the 2019 MLK Celebration.